Lester Burnham (Kevin Spacey) is stuck in a loveless marriage. His teenage daughter Jane (Thora Birch) seems to hate him, and his wife Carolyn (Annette Bening) thinks he's a loser. This leads him to a midlife crisis, where he turns his life upside down and starts to get in shape in an effort to impress his daughter's friend Angela (Mena Suvari). In 1999, director Sam Medes came out guns blazing onto the cinematic scene, swinging out of the gates with his feature film debut, "American Beauty." This film earned eight Academy Award nominations and took home five Oscar trophies, including Best Picture, Best Director for the aforementioned Sam Mendes, Best Original Screenplay, and Best Cinematography, all of which were well deserved awards. Kevin Spacey also took home an Oscar for Best Actor for his portrayal of Lester Burnham, a middle-aged man going through a midlife crisis after becoming infatuated with his daughter's teenage friend Angela, played by Mena Suvari. Angela constantly flaunts her sexuality and her sexual experiences to anyone and everyone who will listen. Unlike Angela, Lester's daughter Jane, played by Thora Birch, who was barely 17 during the shooting of this movie, is a much more reserved, angry emo sort of kid who might be seen as weird to some. It's painfully obviously that Angela only keeps Jane as a friend in order to make herself feel better about how truly broken and awful she is inside, but Jane doesn't seem to care at first. That's what this film is all about, how the characters must discover who they truly are in life, and Jane and Angela only provide the tip of the revealing iceberg in this near perfect drama. The camera work throughout this movie is stunningly amazing. It's no wonder Conrad L. Hall took home a statuette for his work here. There is a scene where Jane's unique, oddball boyfriend Ricky, played by Wes Bentley, shows Jane a video of when he filmed a plastic bag floating in the breeze for 15 minutes. The snippets we see of this video run over Ricky talking about how there's so much beauty in the world, he can't take it. It's moments like this, these remarkable moments of simplicity that offset the chaos, that makes "American Beauty" one of the most deserving Best Picture winners in cinematic history. Everything about this movie is both heavy and telling all in one short sequence. The score is beautiful, and you notice its touching beauty right away. The keys and notes played throughout the course of the film are perfectly meshed in each scene and set the mood for what's happening and what's to come. The rest of the acting, even from those who didn't get nominated, is also great and we'd be remiss if we didn't mention a few other performances. Chris Cooper plays Ricky's abusive military father Colonel Fitts in spectacular fashion, and Allison Janney, who has a small but interesting part, plays Ricky's mom Barbara, who seems to walk around in an almost hypnotic state. Everyone involved in this film to make this one mighty powerful piece of cinema. 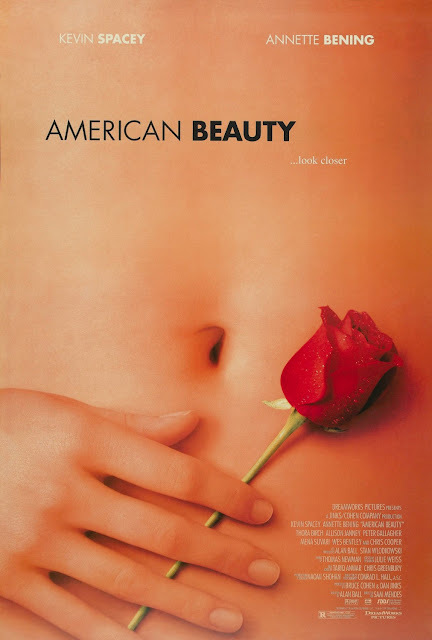 Darkly humorous, as well as socially impactful and emotionally moving, "American Beauty" is one of the most beautiful movies ever to be put on film. It is both simple and complex, elegant and ugly, and mature and childish all at the same time. It is really a complete package, a movie made for fans of film. There are many tonal shifts throughout its run time, as well as numerous interesting, deeply layered characters. Kevin Spacey is stupendous as Lester, putting his acting range on full display by playing a rebellious teenager one minute, and a manipulative, vindictive adult the next. We really couldn't see anyone else being as successful as Spacey in this role. Annette Bening also received an Oscar nomination for her role of Carolyn Burnham, a woman who has spent her life creating the public persona of an ideal life on the outside, but stews and festers as an ugly, nasty personality on the inside. She is wholly concerned with outward appearances and presenting a certain image for herself and her family, an image that couldn't be farther from the truth. In fact, as a whole, "American Beauty" runs on themes of outward persona and the image one puts forward verses the reality of who people actually are when they allow themselves to truly be who they are. This is a remarkable movie and one we urge everyone to watch at least once in their lifetime. It's funny, depressing, dysfunctional, clear, and most of all, a poignant statement on life. One year ago, we were watching: "The Apartment"